It all begins with a sandwich in a California diner on a road in the middle of nearly nowhere. Nick “The Greek” Papadakis owns the diner and is in need of some help. The Greek offers Frank a job which even though he is broke still sounds like...well..work. Which would all seem very sweet except for the fact that they are planning to kill The Greek. Frank would have never had the ambition for such a deed on his own. His idea is that they just take off, become gypsies, live off the land, but Cora wants to be free, and she also wants the diner. She is a femme fatale. Frank is caught up in this woman who is game for anything. She lets him do things to her that would have most any other woman screaming for help. It is hard to determine if Cora actually had any feelings for Frank or for The Greek. Certainly, The Greek and Frank liked each other more than Cora liked either of them. Was she playing the game she had to play to get the accomplice she needed? Was the perversion of their relationship something she needed as well? The Greek was too old for her, but Frank as it turns out was not who she needed either. The trial sequence is convoluted, crafty, and artful as their attorney builds this elaborate defense designed to defeat his frenemy, the prosecutor. He doesn’t care if they are guilty. He only cares about winning. Frank turns on Cora; Cora turns on Frank (another form of foreplay?) which is all part of the defense attorney's plan to set them free. The ending of the novel certainly seems a commentary by James M. Cain that people do not escape their guilts nor their destinies. One of the more suggestive movie posters from 1981. 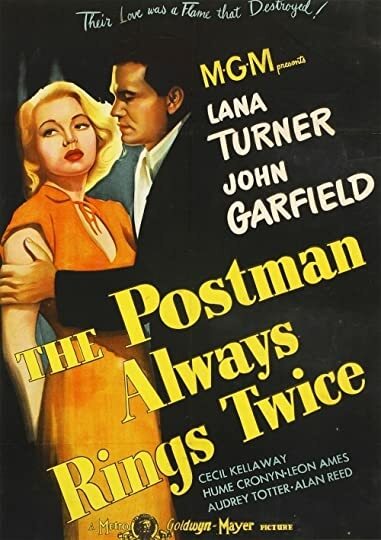 There has been much puzzlement over the title because there is no postman involved in the story or anything that would readily suggest a reason for the title. I’ve been doing some research, and it seems that the most logical explanation that people have come up with is that in this time period when the postman delivered the mail, he would ring the bell on the house once, but if he had a telegram, he would ring twice. Telegrams were expensive, and to receive one generally meant that something bad has happened. The title probably made more sense to people in 1934 than it does to us today. If we accept this explanation, then Cain is warning his audience that nothing good is coming. This is a terrific noir novel, a prime example of the genre. This book and this writer have certainly had an enduring impact on not only the hard boiled mystery novel, but also on literature and Hollywood. 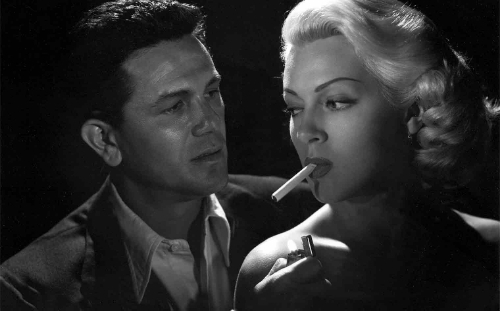 The book has been filmed seven times with most people agreeing that the 1946 version with John Garfield and Lana Turner was the best. The book was banned in Boston for being too sexually violent. There were several scenes that even by contemporary standards had me squirming due to the graphic nature, but I was also reading with a certain amount of awe at the audacity of an author trying to depict the very real, dark aspects of a deranged, desperate relationship. HIGHLY RECOMMENDED! !